In response to acts of police brutality on the day of the referendum, Catalonians have held various strikes, rallies, and protests, including a general strike two days after the election in which hundreds of thousands of citizens took to the streets. On October 27th, the Catalonian parliament (each of the 17 regions in Spain has its own quasi-autonomous legislative body) officially approved a resolution declaring independence from Spain, a move which the Spanish government insisted was illegal. In response to the declaration, the national government fired the leaders of the Catalonian government, dissolved Catalonian parliament, and ordered new elections for the region. Until these snap elections occur, the Spanish government will assume control of the Catalonian administration. Now, both sides are gearing up for a showdown in which a rebellious region tries to resist the wishes of its national government. Although the protests in Catalonia have mostly been peaceful, this is still a potential concern for Vanderbilt students who are currently studying abroad in Barcelona, or those who are planning on studying in Barcelona this spring. Katie Hanson, a junior currently studying in Barcelona, said that the political revolution has not been detrimental to her time abroad. “Besides a few classes being cancelled due to protests, it hasn’t really affected my time abroad, logistically speaking,” Hanson said. “Our program does a good job of sending us security updates via email, so it’s nice to know there are people always looking out for your safety”. Katie was not aware of the potential political chaos when she committed to studying abroad in Barcelona last spring. Vanderbilt students generally study with Council on International Educational Exchange (CIEE), a study abroad program that provides classes for students who speak Spanish and for those who are beginners but hope to be immersed in Spanish culture abroad. Vanderbilt has a partnership with CIEE and does not anticipate there being any issues for students studying abroad in Spain this spring. “While isolated incidents—primarily peaceful protests—related to the Catalonian independence movement continue to occur, in general Barcelona and Spain are very stable and safe,” Vanderbilt Global Education Office (GEO) advisor for Spain Erin Baker said. Some students who are planning on studying abroad in Barcelona this spring are concerned about the potential chaos. Junior Samantha Schwab decided not to study abroad out of fear of violence. Students who want to study abroad in Barcelona in the spring 2018 semester had to commit back in October; however, if the violence gets bad, CIEE has told students that they would give them the opportunity to move to another location where they offer study abroad, like Vienna. For many students, the Catalonian Independence Movement is a unique political situation that is not necessarily a deterrent to their desired abroad experience, despite the disruption and even danger to the residents of the region. Melanie Benson, Vanderbilt junior planning on studying in Barcelona this spring, expressed that she was excited to see what would happen with the movement. “I’m not worried about my safety as an American student studying in Barcelona,” Benson said. “I think it will be interesting to experience mild disruption in a different culture”. Vanderbilt’s study abroad office and CIEE professionals will continue to monitor the situation in Catalonia and cancel the program if the situation becomes unsafe. Baker commented that Vanderbilt Incident Response for Travel (VIRT) is monitoring the situation in Barcelona and is available to help students during any travel emergency. VIRT works 24/7 to keep members of the Vanderbilt community safe while traveling abroad. Hopefully, politically stability will be reached in the region and no Vanderbilt students are adversely affected. Ben Lackner is a junior from Buffalo, New York who plans to study public policy with a minor in history. He developed a love for politics while listening to his dad argue about current events with his in-laws every thanksgiving. When he is not studying or writing for the VPR, he enjoys torturing himself by watching Buffalo sports and reading. Additionally, he plays defense for Vanderbilt's club hockey team and is involved in Greek Life. Nice post. I discover something tougher on diverse blogs everyday. Most commonly it is stimulating to learn content from other writers and use a little something from their website. I’d would rather apply certain using the content in this little blog regardless of whether you do not mind. Natually I’ll offer you a link in your web weblog. Many thanks for sharing. I simply want to mention I’m very new to weblog and honestly savored this web blog. Most likely I’m want to bookmark your blog . You amazingly come with superb articles and reviews. Bless you for revealing your blog site. Please, check your facts and inform people fully if you are going to write about this. It was never a legal referendum, it was something they made up and said it was. Spanish government only tried to prevent it from happening as they do with any illegal activities people attempt. 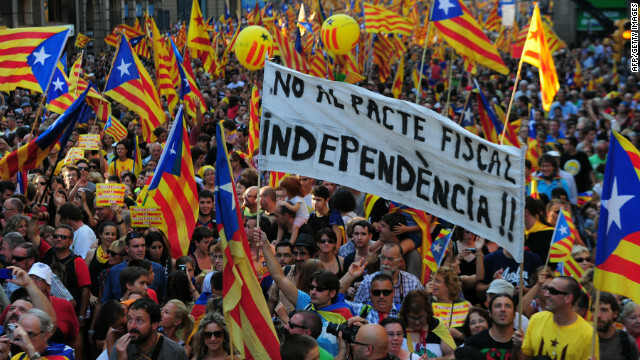 It is true that there was a 90% of votes in favor of the Independence, but the participation was below 45%, as the Spanish government asked their people not to vote as they would get in trouble with the law, as it was an illegal vote, which held most of the people who were against the independence from going to vote. Not everybody wants the independence there, and also, I do not know how trustworthy those results are as it was proved that people voted more than once and the counting method of votes was sketchy, being kind to them.